SNAG® partnered with the Midwest PGA to help the golf industry create more golfers through education in the local PE classes as taught by certified PE teachers within the school district. The program was called “SNAG-A-School™. 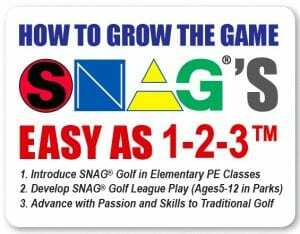 In just three short years, with the Midwest PGA teaching the school teachers how to teach SNAG® Golf in the schools, the PGA section has gone from teaching 3,000 youth how to play golf to over 200,000 children playing golf. This was all achieved by simply changing the paradigm of “How and When” we teach golf from only at a golf facility to teaching a sport in school PE like every other sport does. What an incredible growth of over 6,666% in youth golf happening within just this one PGA section. Now with Adopt-A-School™ we can put the control of “Growing the Game” back into the hands of an individual course owner or city facility to replicate these incredible results. You pick the schools you want to Adopt – you help that school grow golf in PE. You will reap the benefits of growing the game in YOUR own community.